The term ‘product cost’ means the amount of expenses [actual or notional] incurred on or attributable to the production of the specified product. Product cost refers to the costs used to produce the product. It is the measurement in monetary terms of the amount of resources used for the purpose of production of the product. For effective monitoring, specific product cost (cost per unit of product produced) is usually determined. A steel plant consists of several processes which are integrated. These processes produce many intermediate products as well as semi-finished and finished products. Many of intermediate products and semi-finished products along with all the finished products are saleable products. There are also a large number of by-products which are being produced from these processes. These by-products are used either internally within the plant or are being sold to different customers. In such a situation, the cost of the saleable products is determined in the steel plant in several stages. Each stage has a product for which the cost is determined. This product may be a saleable product or may be an intermediate product used as a raw material for the next stage. In case the intermediate product of a certain stage is the raw material for next stage then the determined cost of the product along with the cost of handling losses for the product is assigned to the next stage to the extent the product is consumed in the next stage. The product cost in a steel plant is determined the way it is done in any other manufacturing organization. 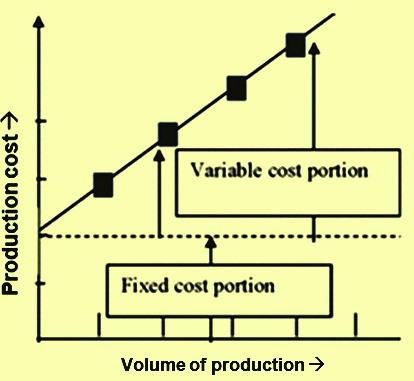 The total cost of producing a product basically consists of two components (Fig 1) namely (i) fixed cost, and (ii) variable cost. Fixed cost is a cost which does not change with the increase or decrease in the amount of product being produced. It is the expenses which are to be incurred independent of the volume of the product being produced. It is the operating expenses which cannot be avoided regardless of the level of production. It plays a crucial role in knowing whether the product being produced is profitable to the organization or it is contributing to the losses which the organization may be incurring. Fixed cost is normally used in the breakeven analysis to determine pricing and the minimum level of production and sales under which the steel organization generates neither profit nor loss. The two major components of fixed costs are depreciation of the assets and interest on the capital loan taken for the creation of the assets. When the organization is able to pay back the capital loan then the interest component of the fixed cost gets eliminated. Also when the equipment gets totally depreciated then the depreciation component of the fixed cost gets eliminated. When the organization has a large fixed cost component, it must produce a significant volume of the product in order to have sufficient contribution margin to offset the fixed cost. Once that production level has been reached, then further increase in the production generally is to compensate only the variable cost per unit, and hence contributes substantially to the profit. Hence, it is necessary that in order to off-set the fixed cost component of the total cost, the organization must generate sufficient revenue from the sale of the product. It is possible only either by increasing the specific value of the product, by incorporating specific features in it or by increasing the volume of the product. The maximum volume of a product which can be produced depends upon the installed capacity of the equipments and processes and cannot be increased beyond a certain limit. Hence the steel organization management always gives added importance for maximizing the production of the valued added steel saleable products with in the same volume of production. Variable cost is that cost of producing the product which varies with the volume of the production. It changes in proportion to the volume of the product being produced. It rises as production increases and falls as production decreases. Major components of variable cost include direct material costs and direct manpower cost necessary for producing the products. Direct cost is that cost which can easily be associated with the production of the product. However, there are several variable costs which are not direct costs. These variable costs are incurred by the organization on several common activities such as purchasing, marketing, and finance etc. Percentage of such costs is to be judiciously assigned to the product for determining the overall variable cost of the product. Variable cost of the product has several components. These are described below. Raw materials – They have a major contribution in the production cost of the product. Raw materials are those materials which are converted into the product by the manufacturing process. The quality of the raw materials and the specific consumption of raw materials per ton of the product are the important factors which has major impact on the product cost. These two factors are also inter-related. Raw materials which are not of desired quality may appear cheaper since per ton rate is lower, but the use of such material adversely affects the product yield resulting into increase in the specific consumption per ton of the product. This ultimately ends up in the higher product cost. Further use of the lower quality raw materials may result into several operational problems which affect the process productivity adversely resulting into lower production rate. Use of the lower quality raw material can also affect the product quality and can also increase the product rejection rates. Auxiliary raw materials – These are those raw materials which do not get converted into the product but are necessary for the process of conversion of the raw material to the product to take place. These raw materials usually go into the waste product stream generated during the production process. Some of these waste products gets recycled or are converted into saleable by products. Specific consumption of these auxiliary materials is an important aspect of the product cost. Higher specific consumption of these auxiliary materials than needed goes into the waste stream unutilized in the process of the manufacture of the product. Also, quality of these auxiliary materials is very important. Lower quality of these materials not only increases their specific consumption and increases the waste generation but it can also introduce certain impurities in the production process which need to be removed before the product is produced. Change parts – There are certain parts of the equipment which have limited defined life. These parts need replacement after their life is over for the production process of the products to continue. Production equipment remains down during the period when the change parts are being changed. Examples of such parts are rolls, guides and roll bearings in rolling mill, hammers of hammer crusher, and blades of a shearing machine etc. Lower quality change parts may be cheaper but they can have low life resulting into frequent changing. Also lower quality change parts can result into equipment break downs which affects the productivity. Hence a proper judgement is necessary to have change parts of optimum quality at a reasonable cost. Consumables – They are those materials which are to be replaced regularly because they wear out or are get used up. They can also be defined as the components of an end product used up or permanently altered in the process of manufacturing, such as lubricants, basic chemicals, coating material like paint etc. Use of consumables of correct specifications is a necessity in the production process of the product. Refractories – Refractories are the materials which provide protection against high temperatures and help in the handling of the hot materials. In certain production shops, there are high process temperatures and in these shops there is high consumption of refractories. Selection of refractories is not only dependent on its cost, but also on its life and the contamination it can cause to the product during its erosion. Overall objective is that the component of the specific cost of refractories in the product cost is to be low without contaminating the product quality. Fuel – Fuel is necessary for the maintenance of furnace temperature for the production process to take place. Fuel can be solid, liquid or gaseous fuel. In some cases fuel also either take part in process reactions or produces some gases in the furnace which take part in the process reactions. In such cases, fuel has dual role to play in the production process. It is a major cost. Fuel invariably produces flue gases which are required to be cleaned and handled. The part of the fuel which does not take part in the production process is the solid residue known as ash. It lowers down the heating value (calorific value) of the fuel. It may also contain some substances which are undesirable for the process to be efficient. Ash goes into waste stream after reacting with the flux (auxiliary materials). Fuel also may contain some elements (e.g. sulphur) which can contaminate the product. Hence, use of fuel of correct specification is very necessary for process to be productive as well as economical though the ‘per unit’ rate of such fuel may be higher. Lower quality cheaper fuel can also be the cause of many operational problems. Power cost – Power cost is also a substantial cost during the production of the product. Power cost can be reduced by controlling the idle running of the equipment. In any steel plant there are three sources of power. They are state grid, captive power plant, and by-product generation of power. All the three types of power have different generation/import cost. The cost of power distribution is required to be added on the generation/import cost. From all these cost weighted average cost of unit power is calculated. This weighted average unit cost of power multiplied by the actual consumption of power for producing the product is charged to the product cost. Utilities – Utilities are normally those materials which are necessary for the process. Compressed air and low pressure steam are the examples of utilities. Utilities are normally produced at some location of the plant and then transported by pipeline to the place where process is taking place. Maintenance of utilities parameters and plugging of the leakages during the transport of utilities has a substantial effect on the product cost. Water – Though water is also a utility, it is usually considered separately since it is used in large quantities in the production process. Although raw water cost is not very high, still it needs to be conserved because of the environmental reasons and also because of its availability. Further water is used in various forms which include direct cooling water, indirect cooling water, drinking water, fire-fighting water, soft water, and demineralized water etc. Further, raw water needs to be processed to get these types of water and processing cost gets added to the cost of water for producing each type of water. Also, water after its use gets contaminated and it needs appropriate treatment for its recycling. Cost of water treatment also gets added to the water cost. Utility gases – These gases are oxygen, nitrogen, argon, and ammonia, etc. Utility gases may be produced within the plant and conveyed by pipeline or can be purchased. Because of their heavy consumption in ironmaking and steelmaking, oxygen, nitrogen and argon gases are usually produced within the plant. Some of the utility gases normally used in laboratories for running testing instruments have very small consumption. These small consumption utility gases are usually part of the stores item in the determination of the product cost. Stores and spares – For maintaining the equipments in healthy running condition, there is a necessity of equipment maintenance on a regular basis. For equipment maintenance, spare parts as well as stores items like lubricants, fasteners, gaskets, welding rods, gas cutting torches, and bearing etc. are needed. They once drawn from the stores are normally charged to the product cost. Till these items remain in the stores, they remain as inventory. Capital repairs – A heavy cost is usually incurred in certain cases when major equipment along with its auxiliary equipments is put down for taking up capital repairs (e.g. capital repairs of blast furnace). Capital repairs also keep the equipment down for a long period. For the product production to continue, these repairs are necessary to be taken up after a certain period on a regular basis. Instead of loading the capital repairs cost on the product cost when the capital repairs are being taken up, a standard provision is made for such cost on a regular basis. Such provision does not make the product cost very high during the period of capital repairs. In some organizations, the expenditure incurred on capital repairs is treated as capital expenditure and in such cases it increases the fixed cost component of the product cost. Manpower – Manpower employed in the organization is usually of two categories. One is the regular employees who are also known as direct manpower and second is contractual work force. Contractual work force can be casual worker or workers needed for jobs which are contracted. Casual workers are also employed through manpower contract. Manpower cost usually covers only the cost of regular employees since the cost of contractual work force is covered under contract heading. As regards regular employees, total cost to the company is charged to the product. This cost includes salaries, incentives and all the benefits given to the employees. Benefits also include post-dated payments which are required to be made as well as cost of the facilities provided to the employees. Works contract – Works contracts can be the contract for supplying casual workers or can be contract for the jobs off loaded. Annual maintenance contracts also come under this category. The expenditure made for the contractual work is charged to the product. Packing costs – The products are required to be packed in order to prevent their damage during handling and transport till they reach the customers’ premises. Some products have simple packing or no packing while other products need elaborate packing. For packing, a cost is incurred in form of the packing materials. This cost is part of the product cost. Interest on working capital – For running the plant on a continuous basis, it is necessary that an inventory of raw materials, auxiliary materials, fuel, stores items and other purchased commodities for offsetting the disruptions/delays in their supplies. Maintenance of the inventory needs funds. These funds are known as working capital. Interest being paid for the working capital funds is charged to the product cost. Hence the level of inventory being maintained is important. It should not be so low that it affects the continuity of the production process. Neither it should be high since it increases the product cost. Works overheads – Under this head those expenditures come which are not directly related to the product and is common to all the units and all the products. Examples of such payments are the expenditure incurred by the works management, and payments made for statutory approvals etc. Such expenditure is judiciously apportioned to various units/ products. Administrative overheads – Under this head comes those expenditures which take place outside the works area. These include expenditures incurred for maintaining the various departments outside works such as departments of finance, purchase, marketing, personnel, and training etc. This expenditure is judiciously apportioned to various units/ products. In addition to the above, there are many departments in the plant, which are common to more than one product or they provide inputs to all the products/units. Examples of such departments are production planning and control, quality control laboratory, engineering workshops, central maintenance, intake pump house and treatment of raw water, system department, and traffic etc. The cost of maintaining these departments is determined and then judiciously apportioned to the different products/units. During the production process of the product, certain solid/liquid wastes are generated which is required to be treated before their disposal/discharge. In some cases the treatment facilities may be captive to the product but in most of the cases, the treatment of wastes is carried out in facilities which are common for several products/units. The operating costs for these waste/effluent treatment units are determined and then judiciously apportioned to the products units to which they are providing service. While producing a product, production of some other products (known as by products) may take place. Examples are blast furnace gas, coke oven gas, converter gas, granulated slag, coke oven by products, nut coke, coke breeze, steel scrap, process steam, by-product power, and mill scale etc. These products can be either used internally in some processes within the plant or can be sold in the market. In case the product is sold in the market then the specific value is taken as its sale value in the market and credit is given to the process producing the product during the determination of the product cost. In case the product is used internally, then a value is assigned to the by-product based on certain principles. Based on this assigned value, credit is provided to the process during the determination of the product cost. The value of credit given is charged to the processes where the by product is being used. During the handling of these by-products there can be losses (in case of gaseous by-product fuel the losses can be flaring losses). The cost of these losses is judiciously assigned either to the process producing the product or divided to the processes which are utilizing the by product.